Around this time every year you most likely feel an urge to spread your wings, try new things, and set out on an adventure. Summer calls out for that all-time family favorite: the road trip. This summer you could take road trips from Baltimore to places like Philadelphia, New York, Atlantic City and Annapolis, or you could breakout and try something new. Only 181 miles and 3 hours long, the road trip to Deep Creek Lake is definitely worth the time! Our quaint Inn is located right on the Lake, making it the perfect place to stay on your road trip. Here are more reasons to put this fun vacation on your list of road trips from Baltimore! To begin your road trip, travel I-68 heading west out of Baltimore and continue on till you reach your vacation destination. Getting away from all the hustle and bustle of city life is a great way to relax. Choosing Deep Creek Lake as your vacation spot allows you to getaway from the stress of day-to-day life to rejuvenate. Our inn is located right on Deep Creek Lake, so you can take a leisurely stroll down to the docks or simply take in the view from a rocker on our covered porch. The lakefront access is fantastic! Another great plus is many of our rooms have beautiful lake views from private balconies furnished with plush chairs. There is no better way to explore Deep Creek Lake than to paddle through the calm water in one of the inn’s canoes or kayaks. Slow down and take your time discovering the entire lake. If you enjoy speeding through the water, rent a ski boat or pontoon from Deep Creek Marina! Another fantastic way to see the area is riding a bicycle. The Inn’s bicycles are the perfect way for guests to explore the surroundings. One thing that probably can’t be found in Baltimore is the arts and craft style décor of the Inn. Our guest rooms and common areas are furnished in a timeless style, which creates a comfortable yet elegant atmosphere and complements the scenic beauty of the lake. Enjoy your time at the Inn during one of the luxurious spa treatments. Make an appointment with one of our massage therapists and drift away into a relaxing and stress free state. Reflexology, Swedish massage and hot stone therapy treatments are available exclusively to guests in our dedicated massage room. 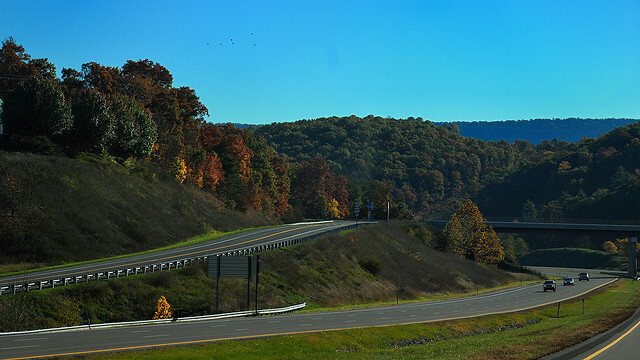 The benefits of choosing Deep Creek Lake as one of your road trips from Baltimore are many. They include a delicious breakfast. Each morning you can indulge in a full breakfast complete with fruits, baked goods, granolas and a homemade hot entree. If you want take advantage of the lake or the surrounding trails early, the continental breakfast is available. Instead of going to a big, loud city, choose Lake Pointe Inn as your getaway destination. Make sure you have a place to rest and relax after your road trip from Baltimore. You’ll have many amazing memories from the trip. Our fire pit is a great place to recount your day. Our rooms and suites have cozy amenities and comfy furnishings, ideal for relaxing after a fun day on the road. Before you leave for the day, we will serve you a hearty breakfast. Staying at Lake Pointe Inn will make the road trip unforgettable!